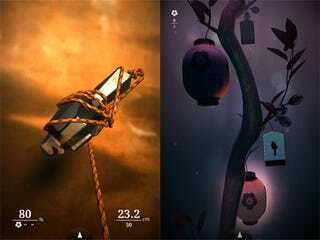 Zen Bound 2, previously exclusive to the iPad, is now available for the iPhone. It takes advantage of the iPhone 4's retina display and gyroscope to bring butter-like smoothness to the beautiful game. Zen Bound 2 carries the same premise as the original Zen Bound: wrap up floating, rotating figurines with a rope. With the gyroscope involved everything feels slightly silkier and roping those damn totems now feels even more natural (not like I know what that really feels like). And the improved graphics are noticeable thanks to the Retina Display.